POI navigation. Provide full-time and all-weather POI (Point Of Interest) navigation,16 direction arrows and 16pcs POI. Six logging modes. "Walking", "Running", "Cycling", "By car", "By plane" and "User defined". 1.5 inch OLED display screen, easy-to-read design to read under strong light. Unique design for runners with "one-button" initiating running tracks. USB fast-reading design. The tracking files are named with date and time. Geotagging. Suitable for all brands of digital cameras available in the market. 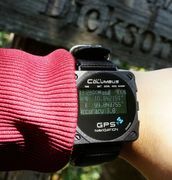 Equipped with barometric and temperature sensor, measure the altitude more accurately. Provide time of sunrise/sunset and moonrise/moonset. Brand new track tool �TimeAlbum Pro�, compatible with Windows, Mac OS and Linux. New Google Maps/Satellites view. Vehicle-mounted auto ON/OFF function, no need of manual power management. 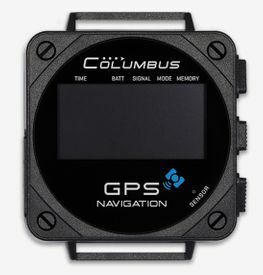 MTK3339 GPS chipset with high-performance integrated with EPS (Enhanced Position System) by Columbus. Only 1 second of deviation in 100,000 years. Attached a meticulously-woven NATO watchband.